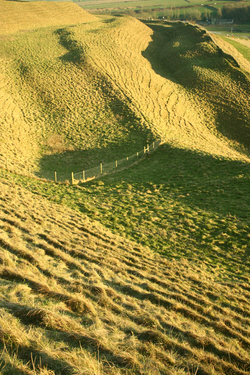 No visit to Dorset is complete without a walk around Maiden Castle. It is a truly beautiful place and an outstanding example of ancient civil and military engineering! Your kids will love it, provided you don’t tell them you’re going to see a “castle”. Grown-ups and children alike associate the word “castle” with massive stone edifices complete with crenellations, turrets, towers and drawbridges. You won’t find that at Maiden Castle, and if that’s what you expect, understandably you’ll be disappointed. On the other hand, if you tell someone they’re going to see Europe’s biggest and best iron-age hill fort, they’re likely to have more modest expectations, which Maiden Castle will easily exceed. 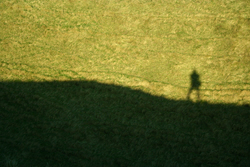 Literally and metaphorically, Maiden Castle is a place that can be enjoyed at many levels. At its simplest it is a beautiful green space set high up in magnificent countryside, commanding views for miles around. It’s a fun place too, which kids love to run around, through and up and down. It’s not often in our post-nintendo, post-psp world that having walked to the top of a hill kids will ask to go farther. 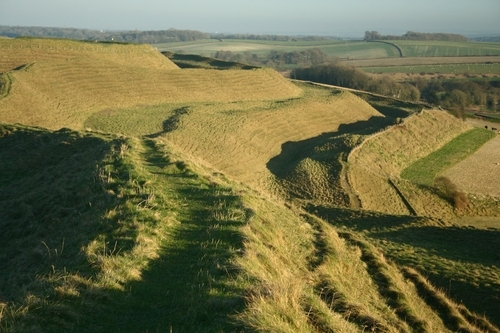 But Maiden Castle is one of those rare places that invites further exploration. Built around 2,500 years ago and probably first used as a settlement some 2,000 years before that, Maiden Castle is made up of three huge concentric embankments, each of which you can walk around. So not only can you choose whether you want a longer, shorter or medium circumnavigation of the hill-top, you can also change the view you have of it and from it. If you’re feeling truly ambitious, you could of course set yourself the task of becoming the “Lord of the Rings” by walking the top of each of the ramparts! But you’d need to give yourself plenty of time to do it, because according to English Heritage the whole site encloses an area the size of 50 football pitches! 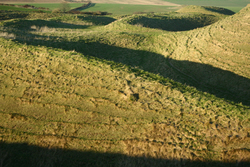 Even by modern standards, Maiden Castle is a massive earthworks. It would take time to build today with JCBs and other modern construction machinery. But this was built by hand with simple tools and like many things handmade in Britain it is something to be truly proud of. After all, how many military defences or civic constructions built in the last 100 years do you expect to be standing and recognisable 2,000 years from now? 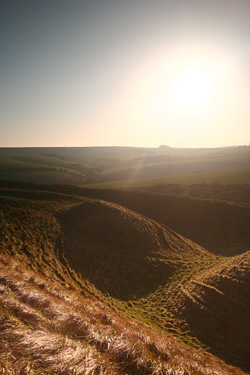 Maiden Castle is a place where your imagination can run wild. In the same century that Jesus was born and having his own run-in with the Romans, the iron age Celts of Dorset were doing their bit to hold back the boundaries of the Roman Empire. Ultimately, in 43 A.D., they failed. Standing atop the ramparts, probably behind wooden stakes, it’s easy to see why the inhabitants of Maiden Castle might have felt safe. No doubt the fort had served them and their ancestors well in tribal conflicts. Even today, clambering up one set of ramparts is a physical challenge, but fighting your way over three sets of defences would have been daunting to all but the most hardened, brave and probably lucky of warriors. But the forces of the Roman Empire presented a different level of threat altogether. They were better-armed, better-trained and better-equipped. Perhaps the superiority of the Roman force is summed up by a skeleton found near the maze-like East gate of the fort. This collection of dried and brittle human remains, now permanently displayed in the Dorset County Museum in Dorchester, is one of many skeletons unearthed during excavations of the site. Many showed the marks and mutilations of hard-fought battle. But memorably, this skeleton includes the metal point of a bolt from a Roman ballista - a cross between a catapult and giant cross-bow - which was embedded close to the spine, presumably from a frontal entry wound. If you get the chance you should visit this fallen warrior too. And if you can, think beyond the brown and dusty bones before you to the man who fought and died some 2,000 years ago. Think too of the family and community for which he was fighting. It’s a far cry from the peaceful, green and beautiful place that is Maiden Castle today. Maybe this man and his fallen comrades would be better placed in a visitor centre at the base of Maiden Castle itself. Certainly it would add context to any visit. More likely, however, it would detract from the mystery and magic of this unique historical monument. After all, the last thing built here was a Roman temple constructed in the third Century A.D., some 200 years after the inhabitants of Maiden Castle had moved into the new Roman town of Durnovaria, which we now know as Dorchester. You can still see the foundations and outline of the Roman temple today, within the central enclosure of the fort. Looking out from Maiden Castle’s ramparts across rolling farmland, modern Dorchester and Poundbury, it’s easy to forget that this place was home and a place of safety for hundreds of people for hundreds of years. It is similarly easy to forget that it was the site of a brutal and bloody battle. But it takes little imagination, looking at the steep sloping embankments and the valleys in between, to picture the sights and sounds of battle. To hear the clashing of sword on sword and axe on shield and the screams of legionaries and warriors as they fought over these same banks and hillsides in a conflict that ended Maiden Castle’s role as a military stronghold and began its 2000 year transition into one of Europe’s biggest and most historic Iron Age sites. And believe it or not, you can visit, see it, touch it and walk around it for free. 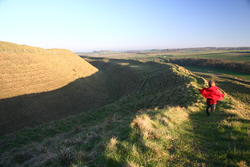 Built around 2,500 years ago and probably first used as a settlement some 2,000 years before that, Maiden Castle is made up of three huge concentric embankments, each of which you can walk around..​"